There’s a time and place for mental stimulation. However, unlike the go-getter cult members, I’m a bigger fan of mental relaxation for promoting work productivity. And Bulletproof Zen Mode definitely fits the “mental relaxation” bill. However, is the “zen mode” even something we want to enter, if we’re to get anything done today? Or will this supplement have us nodding off by lunchtime? Let’s read the Bulletproof Zen Mode review to find out! Who Takes Bulletproof Zen Mode? Conclusion: Does Bulletproof Zen Mode Work? Bulletproof Zen Mode is a mood booster stack that promises to “Reduce Stress & Unlock Tranquility” in support of a healthier mindset. On the nootropic scale, Zen Mode seems to benefit mental clarity and stamina while also enhancing nighttime sleep quality. Bulletproof’s staple Brain Octane® oil makes another appearance here, supplying Zen Mode users with a brain healthy supply of fatty acids. Directions: Take one serving (three softgels) daily to support a healthy mood. Vitamin B6 (as Pyridoxal 5′-Phosphate) – Solid B6 form (P-5-P) at a weak dosage. As a nootropic, B6 may help with neurotransmitter catecholamine synthesis and homocysteine resistance (essentially assisting with cerebral circulation). More on Vitamin B6. Magnesium (as trimagnesium citrate anhydrous) – Magnesium is basically a do-it-all mineral, helping with hundreds of metabolic processes. For brain health, magnesium may improve sleep and neurotransmissions. L-Theanine (Suntheanine®) – An excellent, premium form of L-theanine, an anxiolytic amino acid sourced from green tea. L-theanine seems to work by promoting alpha brainwaves, the brain frequencies associated with calm, creative thinking. More on L-Theanine. 5-HTP (from Griffonia simplicifolia) – Serotonergic precursor that seems to increase serotonin and melatonin levels, effectively improving mood and sleep quality. However, due to 5-HTP’s role in serotonergic pathways, it’s not recommended to supplement 5-HTP while on pharmaceutical antidepressants (SSRIs). More on 5-HTP. 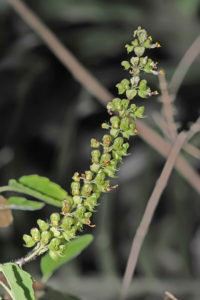 GABA (PharmaGABA®) – Standard GABA supplements are believed to be incapable of crossing the blood-brain barrier, rendering the ingredient useless. As a brain chemical, GABA helps resist over-excited cognitive processes, essentially helping the brain relax. I suppose PharmaGABA® might have a better shot at crossing the blood-brain barrier, as suggested by this being a GABA brand. However, this is mere conjecture at this point. Brain Octane® Oil – The staple Bulletproof ingredient, Brain Octane® oil is the coconut oil often applied to coffee for its daily brain health benefits. Bulletproof claims this oil may help improve cognitive energy, clarity, and long-term brain health. More on Brain Octane® Oil. Holy Basil Leaf Extract – I often drink this herb in tea form, and the best way I may describe the experience: feel-good clarity. Not a bad choice for anti-stress relaxation. Ashwagandha Extract (Sensoril®) – Another awesome choice for anti-stress relaxation, ashwagandha possesses significant anxiolytic benefits, erring on the side of sedation for some. This is a great herb for chilling out and getting sh*t done. More on Ashwagandha. Saffron Stigma Extract (affron®) – Unique, patented saffron extract, used therapeutically to improve mood disorders. Both safe and effective. Zembrin® (Sceletium tortuosum extract) – Many pre-workout supplements supply this to add a feel-good cognitive rush to their formulas. As a nootropic, Zembrin seems to work best as an anxiolytic (anti-anxiety) mood booster. When it comes to better work performance, I find that the stimulation route isn’t really the best way to go. If anything, getting hyped on stimulants does the opposite for me: the feel-good mental rush, more often than not, redirects me from my work assignments to Overwatch or Rainbow Six: Siege, etc., etc. However, mental relaxants, such as Bulletproof Zen Mode, which accomplish the opposite of stimulants, do wonders for my work productivity. L-Theanine – this one in particular pairs well with coffee and other sources of caffeine. Ashwagandha – powerful, herbal, mental relaxation; feels good, man. And that’s only two awesome ingredients in this anti-stress loaded stack. Altogether, Bulletproof Zen Mode mixes and matches an impressive list of effective cognitive relaxers. And what’s great about these relaxants is that they don’t over-relax you to the point of mental shutdown. Yes, these nootropics may help you get better sleep, but they won’t have you nodding off at your desk. Granted, it’s not a perfect supplement. Bulletproof Zen Mode makes a couple annoying moves that I don’t like, such as: 1) the Bulletproof Zen Blend is a proprietary blend, obscuring each of its ingredient dosages, and 2) only 15 servings per bottle? If you enjoy this stack for daily mood balance, you’ll be replenishing your stock more often than you would with most other nootropic supplements. Even so, in terms of ingredient choices, quality, and quantity, Bulletproof Zen Mode is a finely crafted supplement that delivers on its health claim promises. Definitely worth at least checking out. 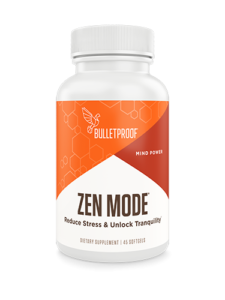 Bulletproof Zen Mode promises to reduce stress and unlock tranquility, and, for the most part, this formula delivers. Zen Mode users may expect less stress and anxiety for better relaxation and sleep. For the most part, the ingredients are all exceptionally potent; a few being premium, patented forms. Brain Octane® oil makes another welcome appearance in this stack, supplying brain healthy fats for daily mental nourishment. PharmaGABA seems a better GABA than most, yet I’m still unsure whether it’s able to cross the blood-brain barrier. 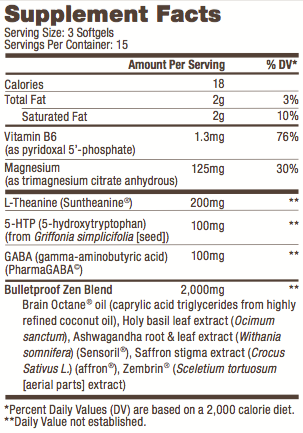 The Bulletproof Zen Blend is proprietary, thus hiding the blend’s ingredient dosages. Raise the price if you must, but at least give us more than 15 servings per bottle. Bulletproof supplements tend to price themselves in the higher-than-average range (at least I consider $3.00 per serving higher-than-average), and I suppose this may be due to the Brain Octane® oil and other premium, patented ingredients. Which, okay, fine, but 15 days’ worth of servings is a low amount. Bulletproof Zen Mode essentially offers a natural, safe approach to anti-anxiety, anti-stress mood boosting. This supplement’s relaxation benefits may improve both daytime work performance as well as nighttime sleep quality. You can buy Bulletproof Zen Mode through various online retailers, including the Bulletproof online store and Amazon. I’d say so. Like other Bulletproof supplements, Bulletproof Zen Mode is an impressive nootropic product; however, this one works particularly well for mood and relaxation enhancement. And in this day and age of overstimulation and constant mental engagement, a little relaxation may go a long way in boosting your work productivity. There’s much to admire about the 24/7 up-at-all-hours go-getter. Yet, odds are many of the most successful place as much importance on mental replenishment (e.g., sleep) as they do mental activation. Bulletproof Zen Mode primarily assists with the former, placing greater emphasis on relaxation than stimulation. However, if you’d like to check out more diverse acting nootropic stacks, I recommend reading my Best Nootropic Supplements of 2018 list. What would be a similar product that isn’t as expensive and gives you more than 15 days? And, it’s currently sold out on their website and amazon. Thanks! If you’re looking for a stress reducing nootropic stack, here’s a post I wrote in “Nootropics for Stress” that might be helpful. Similar supplements you might enjoy are Alpha Consciousness and Genius Joy. It looks like this product is no currently available and may not be for some time (the Bulletproof website says: “Extended Wait: Zen Mode will return later this season”). Any idea when it may be back? Any similar product you recommend in the interim? Thanks!